I haven’t been out shooting much this past week because the aspens are still quite green. They are late. I mean LATE. 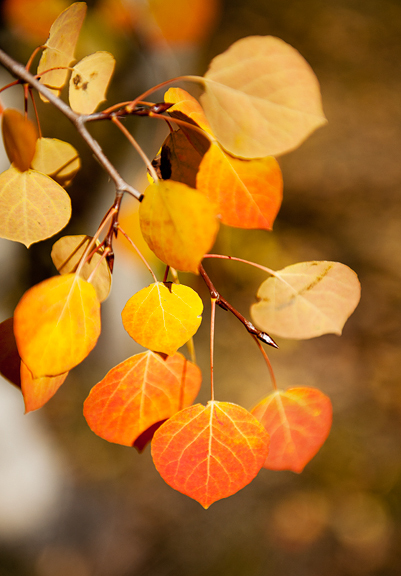 Late is fine, except changing aspens begin flirting with cold weather. Cold is fine too, but frosts and hard freezes can wreck the colors. 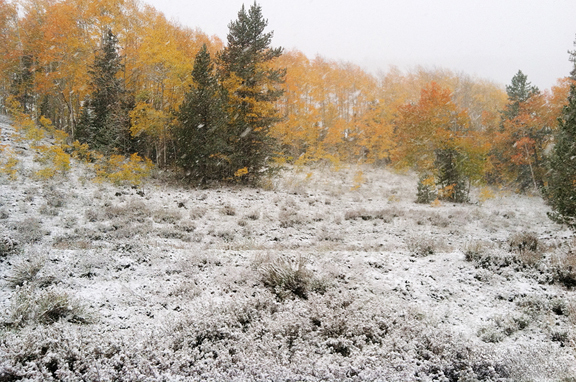 It seems that green aspens manage to endure the frost and snow for the most part. Our days are usually sunny and warm such that the healthy stands can bounce back. 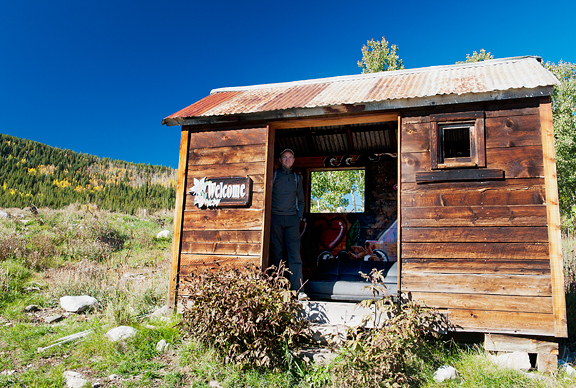 That storm took its toll and much of the local color that had been humming along turned to a rust orange or black. I call it freeze die off. 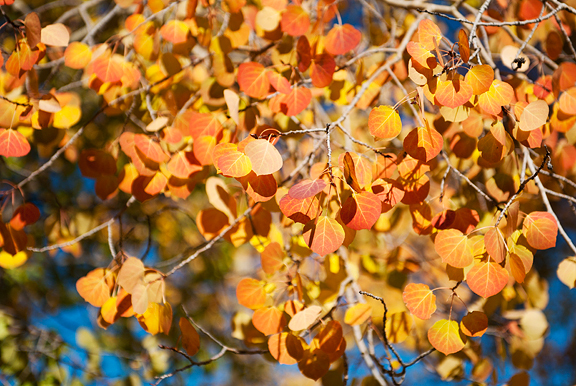 The upside of all this is that there are still a lot of green aspens and this week is looking to warm up. I think there is potential. The question is if the leaves will get going before the next storm barrels through. In the meantime, I’m watching it all unfold from my hikes, bikes, and trail runs. 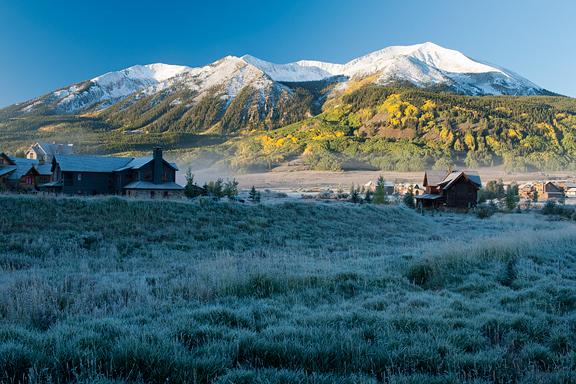 With all of the chilly weather we had, I have been cooking, baking, and becoming more comfortable with my kitchen in Crested Butte. Todd, Diane, and I were so enthusiastic about picking peaches last week during their visit, that I was left with many pounds of ripe, sweet organic peaches. Even if Jeremy liked peaches (which he does not), there was no way we could both finish it all off before the fruit flies took over our house and flew off with Kaweah. So I made several peach crisps with oatmeal toppings to give to some of our awesome neighbors. 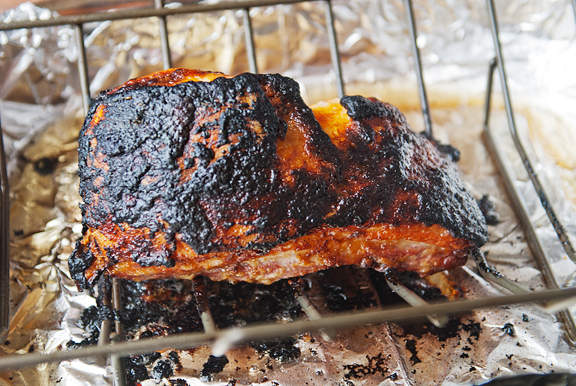 You wouldn’t know me for a baker in summer because the heat makes me so dang cranky, but cooler weather ushers in more oven and stove time for things like peach oatmeal crisps or… miso roast pork belly. Earlier this month when we were home on the Front Range, I had come across a couple of porcini mushrooms on a hike. They seemed to be flushing again with all the rains in the mountains. Little did I know the rains would become such a menace for the region within 48 hours. But before all of the destruction, I sat with these two lovely (totally worm-free!!) 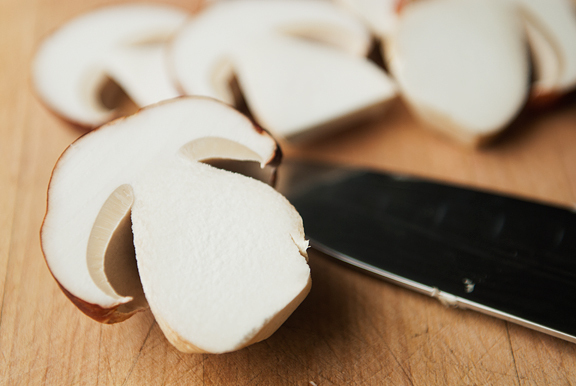 mushrooms and wondered how I should prepare them. Pork belly was an idea I had for a while because bacon with its smokiness can overpower the flavor of a porcini. 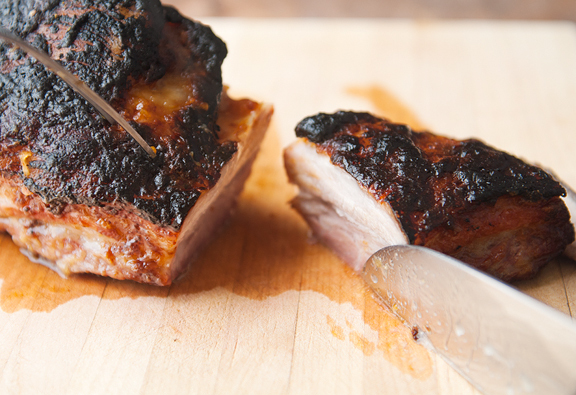 You could totally do plain old pork belly and it would be fantastic. 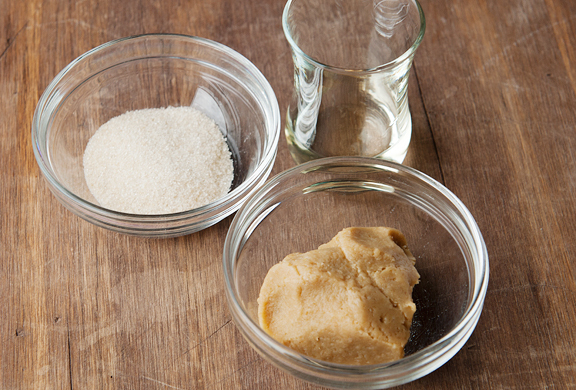 Rifling through the refrigerator, I found some white miso paste that needed to be finished. I don’t think I’ve ever had anything with miso that I didn’t love. Miso and pork belly? That’s salivary glands in overdrive right there. And be sure to get at least a two pound slab of pork belly. I find the smaller pieces tend to dry out and burn more easily when roasting. Plus, you will want leftovers. The trickiest part of this whole dish is keeping everything warm or hot. 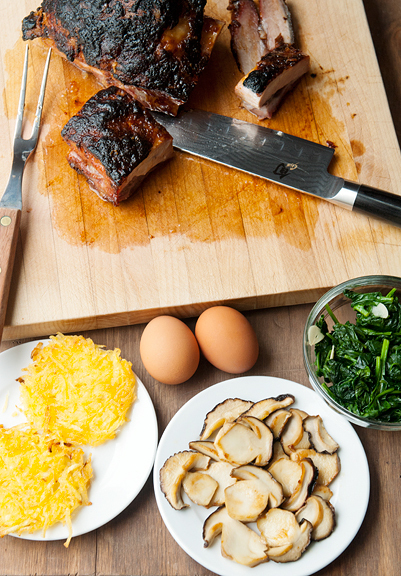 The other components like the butter-sautéed mushrooms, the spinach, and the hash browns can be made while the pork belly is roasting, and kept warm or reheated to serve. The eggs really ought to be made just before serving otherwise the runny yolk will become a standing yolk, and everyone knows that a runny yolk is the sexiest thing you could put on a plate. Also? I just want to point out that you can put whatever you like in this stack. When the pork belly has baked for 90 minutes, it’s time to remove the foil tent and get down to business. That business would be cranking the oven up to 450°F and slathering some of that heavenly miso sauce on the pork belly. All over. Roast it for 10 minutes, flip the pork, slather more miso sauce, and roast some more. This happens one more time except the final roasting is 15 minutes so you can get a nice crisp skin on top. My pork belly got a little burnt on top (I think miso burns pretty easily), so be sure to watch it carefully in those final minutes. It still tasted incredibly melt-in-your-mouth good. If you include spinach, keep that layer on the bottom. It tends to weep and no one wants soggy hash browns or soggy anything for that matter. The entire stack makes a pretty satisfying meal for breakfast, lunch, or dinner. I like the play of the different flavors and textures, but that miso pork belly is the big winner and can easily disappear in a matter of minutes if you aren’t careful. Heck, if you don’t want to trouble yourself with all the other parts, at least make the pork belly because you will be so glad you did. 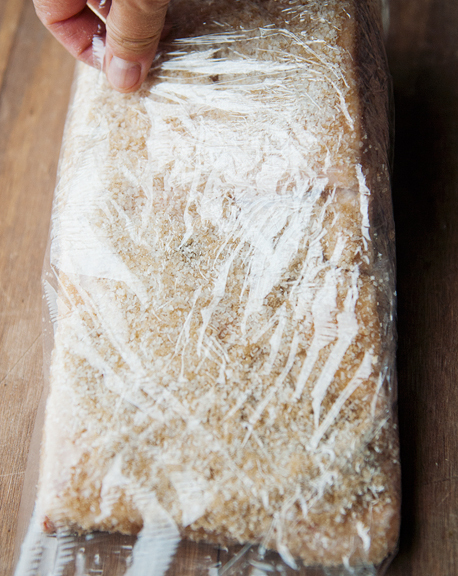 Make the pork belly: Line a baking dish large enough to fit the pork belly with plastic wrap. Place the pork belly in the dish. 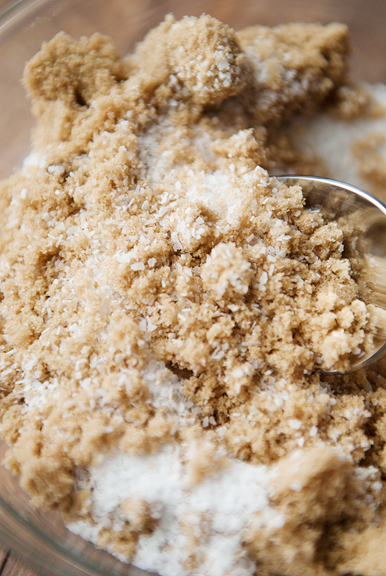 Combine the brown sugar and kosher salt in a medium bowl and mix together. 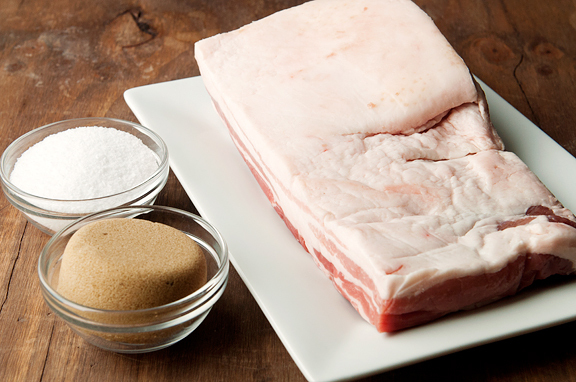 Rub the brine all over the pork belly so that the entire slab is coated. Pour any remaining brine on top of the pork belly. Wrap it up tightly in the plastic wrap. Set it in the dish and refrigerate overnight. 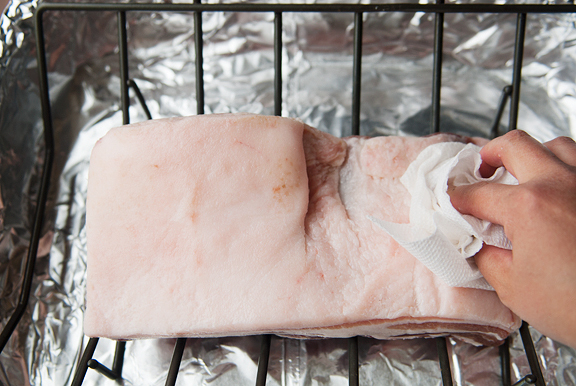 After the pork is done brining, preheat the oven to 350°F. 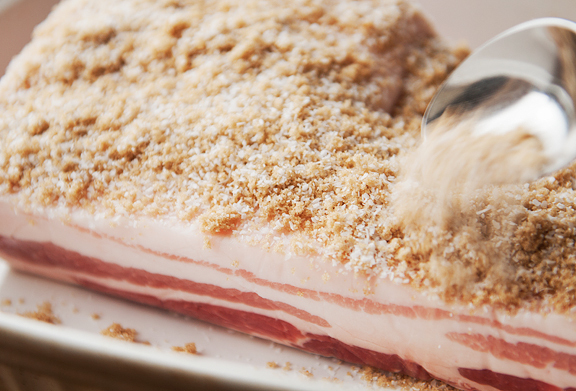 Rinse the cure off the pork belly and pat the slab dry. 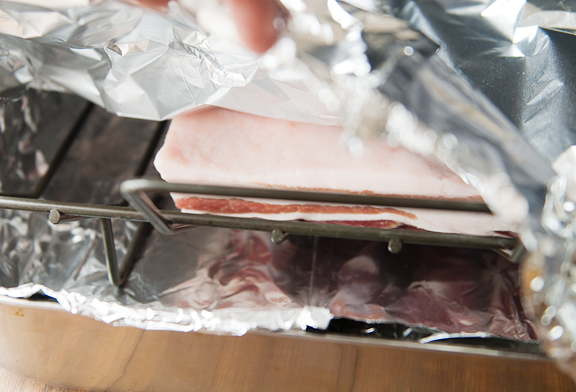 Set the pork belly, fat-side-up, on a rack in a roasting pan lined with foil. Cover the pan with more foil and roast for 90 minutes. While the pork belly roasts, combine the miso paste, mirin, and sugar in a small saucepan and stir together over medium heat. 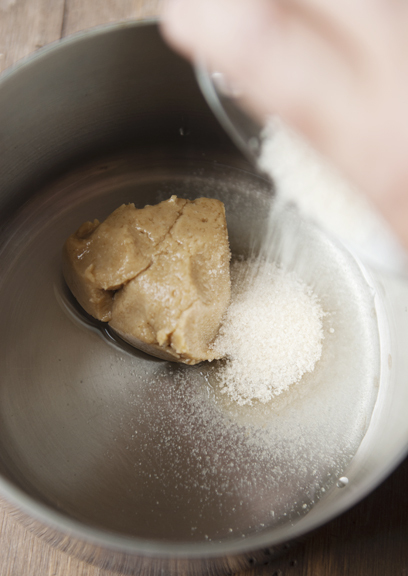 When the sugar is dissolved, remove from heat and set aside until needed. You can nominally start preparation of the other parts of the stack about 15 minutes before the 90 minutes is up. 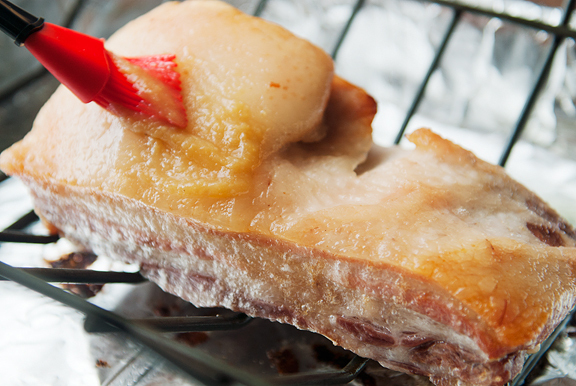 After 90 minutes, remove the pork belly from the oven and increase the temperature to 450°F. Remove the top foil cover (you’re done with it). Brush some of the miso sauce on the top and sides of the pork belly. Return it to the oven for 10 minutes. Take the pork belly out and flip it over. 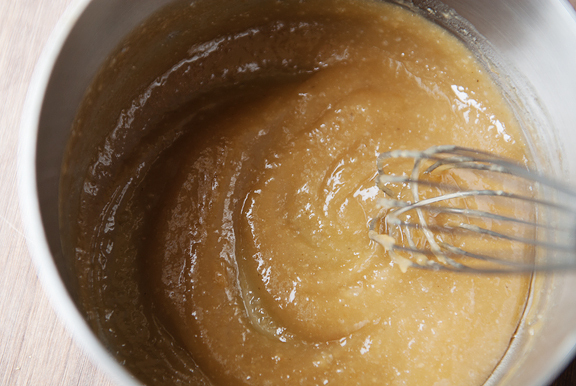 Brush the top and sides with miso sauce and return to the oven for another 10 minutes. Take the pork belly out and flip it one last time, brushing the top and sides with the rest of the miso sauce and finish it in the oven for 15 minutes until the top is crisp. Remove from oven and slice. Sauté the spinach: Heat 1 tablespoon of oil in a sauté pan over high heat. Add the garlic and stir until fragrant (a few seconds), then add the spinach. Stir the spinach around until it is half wilted. Add a pinch of salt. Continue to sauté the spinach until it is cooked, but still a bright dark green. Remove from heat and set aside. Make the hash browned potatoes: Squeeze as much liquid out of the shredded potatoes as possible. Heat 2 tablespoons of vegetable oil in a cast iron skillet on medium high heat. Add the shredded potatoes (either in small rounds or one giant sheet to be sliced later). Sprinkle a little salt on the top and let fry until golden brown (this takes a few minutes – try not to burn the potatoes). Flip the hash browned potatoes over and sprinkle a little more salt on top. Fry until the bottoms are crisp and golden. Remove from heat and set aside. 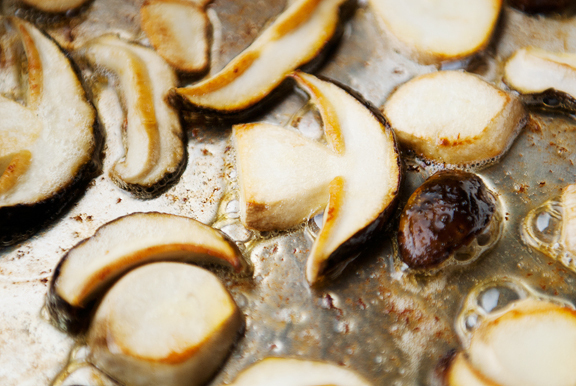 Sauté the mushrooms: Set a frying pan over medium high heat. 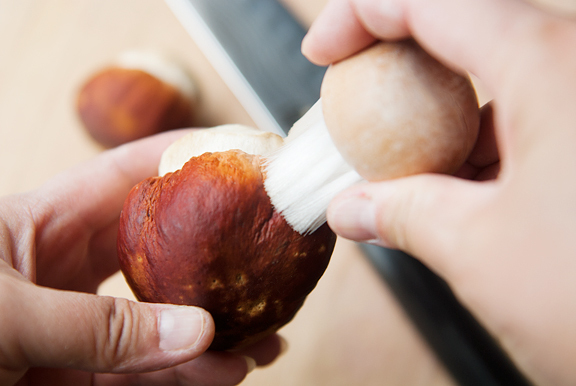 Add the mushrooms and dry fry them for a minute on each side until they wilt. 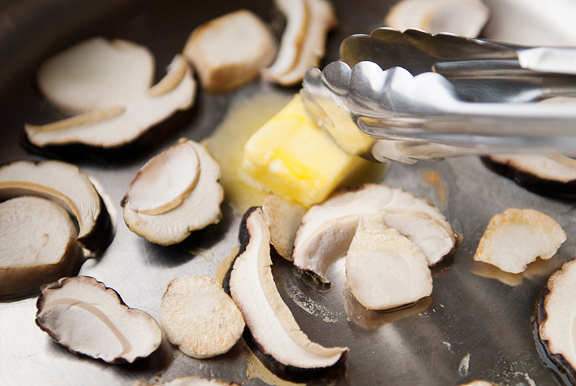 Add 1 tablespoon of butter and a pinch of salt and sauté the mushrooms until their edges turn golden brown. Flip to lightly brown the other side. Remove from heat and set aside. 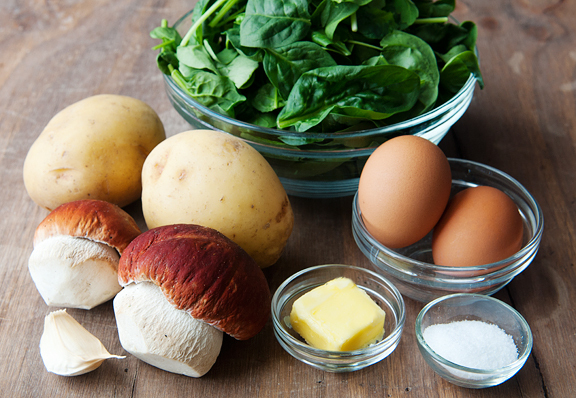 Assemble the stack: Layer the sautéed spinach on the bottom, then place a disk or slice of hash browns on top, then layer some sautéed mushrooms. 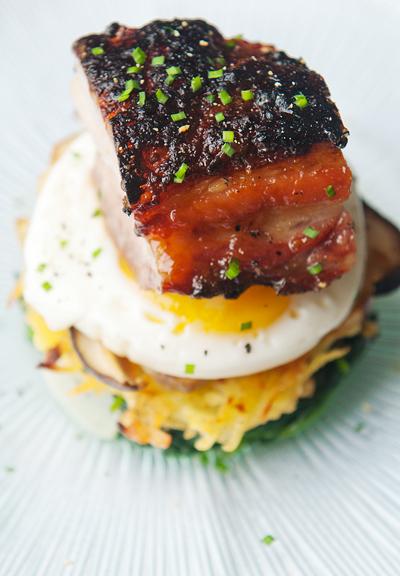 Set a fried egg over the mushrooms and top it all with a generous slice of pork belly. Serve immediately. Ohhhh, Kaweah! Sweet, sweet pup. This is just one of the most beautiful things ever…when you were telling me about this dish the other day I was excited about it, but seeing the photos and being able to kind of taste everything through them is making me feel like I need to go out right now and buy some pork belly. And find some porcini mushrooms. Just amazing! We are late here with the colors and I am worried that the storms will destroy the leaves before I have a chance to enjoy their fall clothes! Wow this is the breakfast of all breakfasts. 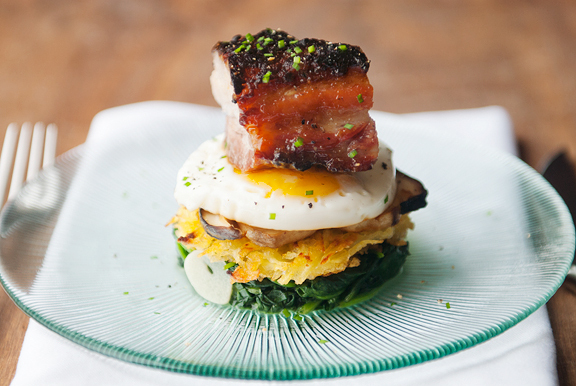 Each layer of ingredients contributes a different flavor and that miso pork belly! I’m going to have to wake up early one morning to prepare this beautiful breakfast! You are right about red aspens and you are right about this breakfast. This must only be for very special folks! I’ve never made pork belly; now it will happen. you are brilliant and a terrific cook – really enjoy your posts. Dear Jen, how I enjoy reading your posts and looking at the beautiful photos – it’s like a travelogue for me – armchair travel. I know I’d never get to your part of the world which you describe so vividly and do the things you do. So it is a great pleasure to be given an insight to life on the other side of the world. And the recipes are a bonus…ideas! Thanks so much…and you look a picture of health in this post, may I say how well and beautiful you look! Pork belly is one of the most use meats in my house hold. Yes I said most used! While it is fatty, you do need to eat ablot to have a great meal, also it means I eat more veggies! Allison – it’s soooo good!! 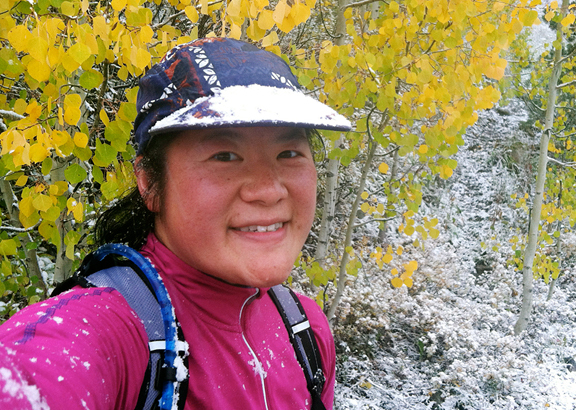 Rocky Mountain Woman – yeah, the fall colors were all kinds of crazy this year. 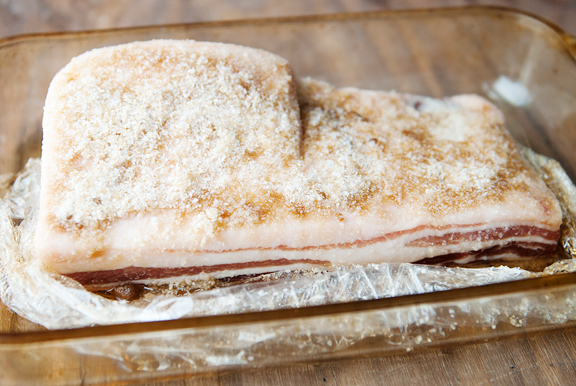 Christine – you can definitely prepare the pork belly ahead of time and just heat it up in the oven the next morning. 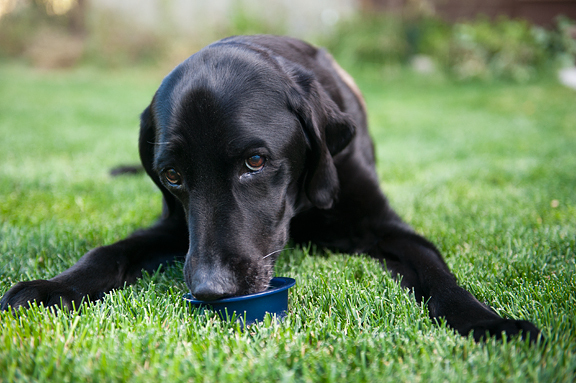 Belinda – it’s true you don’t need to eat a lot. I feel that a little bit at a time is just fine and adds sooooo much flavor! Kacey – ha ha, you’re welcome!